Win a luxury stay in Greece! Mideast Travel celebrates two more nominations at the World Travel Awards and offers you an unforgettable journey to Greece! Take part in our big contest below and have the chance to win a luxurious two-night stay for two guests, in a double room including breakfast, at the Airotel Hotel of your choice in Athens, Patra or Kavala. Celebrate with us, cast your vote and give us the chance to win two more awards at the “Oscars of the tourism industry”. 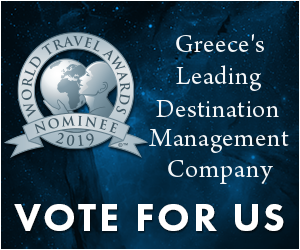 You can vote for Mideast Travel as Greece’s Leading Destination Management Company here and as Europe’s Destination Management Company’s here until April 28, 2019.